These Bifurcated fans are recommended for high volume, low resistance systems. The fan can be installed at any angle in a duct line with its motor compartment isolated from fumes. For horizontal or near horizontal positions a drain plug can be fitted at the lowest part of the casing. Bifurcated Fans are direct driven axial fans where the motor is encased in a metal box to isolate it from the airflow. This makes bifurcated fans ideal for exhausting fumes, corrosive gases , moisturized air and hot air . The motor must have access to ambient air. Incepted in the year 2005, our entire range of industrial fans finds applications for electronics requirements. Our wide assortment of industrial fans is based on latest technology and is fabricated using imported raw material at our vendors premise. 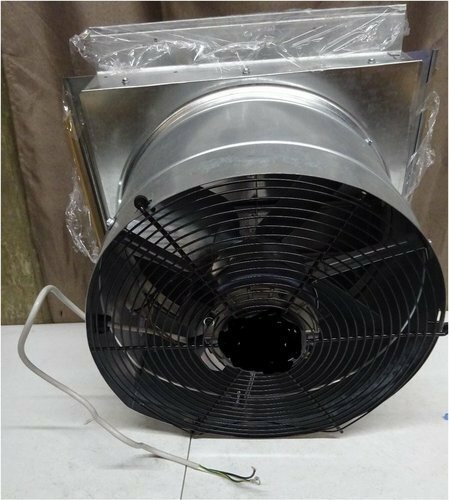 Some of our fans includes air circulator fans, industrial air circulators and axial fans, air ventilators, poultry fans, greenhouse fans and exhaust fans. Adhering to our competency, we procure our entire range from leading manufacturers who follow stringent quality measures of international standard in their production processes. We always strive to offer high quality products in order to achieve complete customer satisfaction.